Sure, at US$13 per person Topkapi Palace is more expensive than most other sites in Istanbul. And no, that entrance fee doesn't cover everything. But on the other hand? Sometimes it's just awesome to see gorgeous examples of architecture and history and culture. Just over a year ago, our best friends Philip and Lauren moved to New Zealand. (Some of you may recall the ridiculously affectionate slideshow we posted to commemorate the event.) For Lauren, it was an exciting new adventure to a place she'd never been before. For Philip, it was a return to a home he hadn't seen in a decade. And then, a few weeks after their joyous arrival in his hometown of Christchurch, something happened. On Tuesday, February 22, the world around them shuddered and collapsed, and we nearly lost them forever. At 12:51pm, the city of Christchurch was rocked by a devastating earthquake, in what would turn out to be the second-deadliest peacetime disaster in the nation's history. 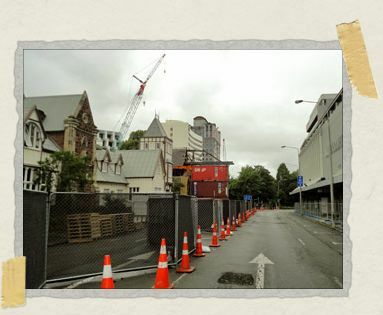 Trapped in a high-rise building, Philip and Lauren looked out the window and saw the iconic tower of the 130-year-old Christchurch Cathedral, the symbol of the city, crumple and fall to the ground. The terrifying ordeal they experienced that day is not my story to tell, and I'll not tell it here. But suffice to say that those of us who love them feel very, very lucky to still have them with us today. The damage inflicted upon Christchurch that day was compounded by the fact that the city was still recovering from another quake, one that had struck about five months earlier. Known as the 2010 Canterbury Earthquake, it had a magnitude of 7.1, and resulted in massive structural damage throughout the region (although thankfully nobody died in that one). The real way to measure an earthquake, though, isn't magnitude. The real way to tell how bad it is, how bad it feels on the ground, is to use something else called peak ground acceleration. That gives you a number (usually between 0.0g and 1.0g) representing how much the earth actually moves and shakes in a given location. Any acceleration value of over 1.24g puts you in the highest category, where the shaking is described as "extreme" and the resulting damage is described as "very heavy." The 2011 Christchurch earthquake had an almost unbelievable peak ground acceleration of 2.2g, making it one of the most powerful earthquakes ever recorded anywhere in the world. Philip doesn't really remember any quakes from when he grew up in Christchurch. For him, it's as alien as if Philadelphia or New York or London suddenly turned overnight into major earthquake centers. Because these days, quakes are very much on everyone's minds in Christchurch. Everyone has a plan in place, everyone knows who to call, who to check on. People are careful about putting anything breakable up on high shelves. A year's worth of news coverage has made everyone an expert in even the most arcane aspects of earthquake science. For instance, I'd never before heard about liquifaction, where an earthquake soaks the soil with water and sewage, changing the ground itself to a quicksand-like muddy mass that spreads across lawns and streets, filling basements and covering cars. In Christchurch, it came up in conversation several times a day. When we first arrived home with him, before we'd even unpacked, Philip sat us down and gave us an earthquake safety speech. He stressed that he wasn't trying to scare us, or make a big deal out of it or anything... just that he wanted us to know what to do when one happened. I felt our first tremor that evening, just after Jessica had fallen asleep. There was a larger one later that night, one so big that Philip popped his head in to check on us afterward (and to make sure that his television hadn't fallen over or anything). Expecting to find us a bit panicked after all the shaking, he was thoroughly amused that we'd both slept through the whole thing. 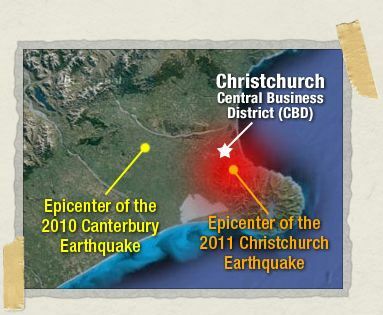 The 2011 Christchurch earthquake drove a dagger through the heart of the city's CBD (central business district, or downtown). When it struck, a woman named Mary-Ann Jackson was working as a receptionist on the ground floor of the CTV Building, a few blocks from the cathedral. When the building started shaking, she didn't hesitate – she just dropped what she was doing and sprinted out the front door. It was a decision that saved her life. She didn't slow down or turn around, despite the sudden, shocking cocophany of sound behind her, until she had gotten all the way across the street. When at last she did turn to look, she saw that the entire six-story building had collapsed to the ground. More than 100 people died in that building, most of them students at a language school on the third floor. It was a site that would come to be called "the death zone," but it accounted for barely half of the fatalities in the city that day. Throughout the CBD, buildings were battered and broken. People were injured, or trapped, or worse. In the days that followed, virtually the entire CBD was cordoned off. Today, more than a year later, it remains inaccessible to the public. Stores and restaurants and offices sit hermetically sealed, with half-empty coffee cups and half-eaten sandwiches laying next to half-read newspapers, just as they were the moment some terrified person threw them down to flee for his or her life. The cleanup crews methodically go through one building at a time, in post-apocalyptic HazMat suits more often then not. When we were there, they had just gone into a Burger King, the first time in a year that anyone had set foot inside. I can only imagine the sights, and smells, that must have greeted them. Philip sometimes works inside the sealed-off area as part of the rebuilding effort, and I can't imagine how eerie it must be for him to eat his lunch in the middle of a crumbling, empty street that was once a busy city thoroughfare. He took us into the city during our visit there, and it was a much more emotional experience than Jessica or I had expected. Standing at the walls that demarcated the closed-off portion of the CBD, we could look through small windows at the damaged city center. It was heartbreaking, in a way I'm not sure I can put into words. It was almost like looking at a person, some victim of a brutal, arbitrary act of violence. Like watching them try to slowly pull themselves back together again. The cuts were still so deep, the scars so fresh. It was agonizing to see. We went around to a part of the wall where we could see, looming above it, the building where he and Lauren had been trapped. Like almost every other building over nine storeys high, it's scheduled to be demolished. But for now, it's still there, just as it was that day. 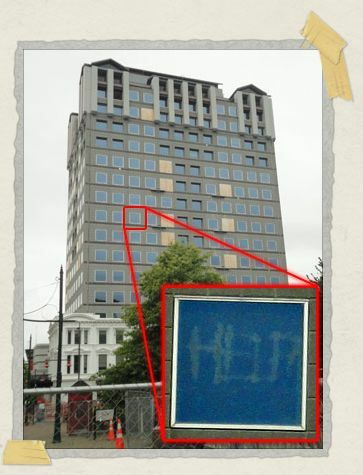 From where we were standing, we could still make out the word HELP written up on one of the windows. A woman in their group had written it in lipstick, trying to attract the attention of the rescue crews down on the ground. We came very close to losing out best friends that day. Both of us started crying at the sight of the building, and we basically rugby-tackled Philip in a group bear-hug that continued for a very long time, over his increasingly amused protestations. The Maori phrase kia kaha means "be strong," and it has long been used in NZ to indicate support and encouragement. But after February 22, it took on a special meaning in Christchurch. At a memorial service a few weeks later, England's Prince William ended his address with it, and drew "applause and tears" from the tens of thousands of mourners present. Kiwis are a hardy, indomitable people. We found them to be welcoming, friendly, gregarious, and quick to laugh. But they are also just as tough as nails. You simply cannot keep them down. No earthquake could do that, regardless of how many aftershocks it has. Just ask a young man named Sam Johnson, who was a college student at Christchurch's Canterbury University when that first quake hit in September 2010. He formed the "Student Volunteer Army" to help with the massive cleanup job, and together with a couple thousand of his fellow students, they cleared over 65,000 tons of liquifaction. When the big one hit in February 2011, Sam called his army to action once again. At its peak, the SVA was deploying over 13,000 volunteers a week, and the work they did was just staggering. Just a few weeks ago, Sam was named the Young New Zealander of the Year. In his acceptance speech, he spoke directly to the thousands of fellow students who had volunteered alongside him, telling them, "you are my heroes." These are a strong people. We went with Philip to Cashel Mall, another testament to the typical Kiwi can-do approach to any challenge. 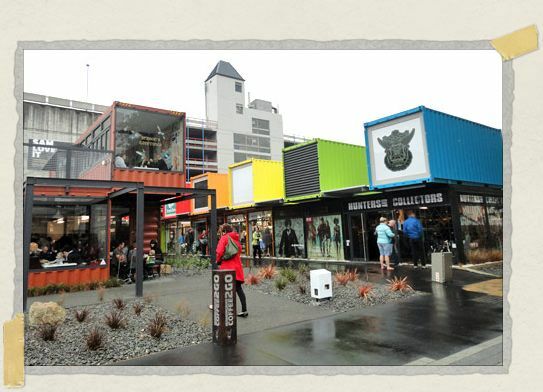 Christchurch's City Mall was closed after the earthquake killed several people there, but within months a "pop-up" version of it was opened along Cashel Street, built entirely out of shipping containers. They were stacked atop each other like Lego blocks, with broad store windows cut into them revealing the unexpectedly plush interiors within. It was a classic bit of Kiwi ingenuity, from a people who take fierce pride in taking whatever materials are available and making them work, rather than sitting around waiting for the "right" materials to arrive. Sometimes it can seem like Mother Nature has taken a bit of a dislike to Christchurch, what with the beating she's been giving it lately. Just since we returned home, there have been six earthquakes there rated as either "strong" or "very strong." But you only need to get to know a Kiwi or two to see that Christchurch is going to rise from this tragedy even stronger than it was before. Kia kaha, Christchurch. Be strong. Glad you enjoyed it! We can't wait to come back and visit you again someday soon! got chills just reading… having heard a bit about phil and lauren's story just months after it happened (during my visit last april), i'm so glad to have some follow-up. love the ingenuity. Yeah, everything was all still so terrifyingly recent when you visited – it's hard to believe that was so long ago now! We miss you! NZ is high on my travel wishlist, especially Christchurch. Can't wait to get there one day. I hear it is awesome! New Zealand has always been on top of my must travel destinations. Looking forward to traveling there one day.